With April coming soon plans are under way for our Spring Fling, which will be held on Saturday, April 13th, from 9am to 1pm. We have a dozen talented vendors signed up, bringing items they have handmade that will be available for sale. With Easter and Mother's Day coming soon, and just Spring itself right around the corner, I'm sure there will be something for everyone. 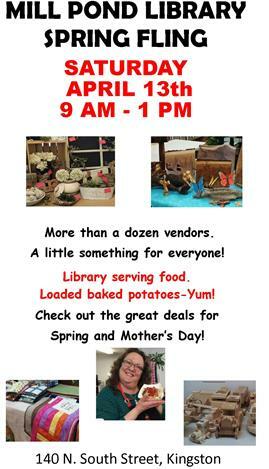 Stop in that morning to browse or shop, and also enjoy some tasty food provided by the library. Homemade cinnamon rolls and coffee will be available first thing that morning, with loaded baked potatoes being served for lunch. Proceeds from the fundraiser will be used to replace the library's front awning, which didn't survive the ice, snow, and wind this past winter. There are now 4 places where the fabric has come apart. The awning was put up 15 years ago, and does a wonderful job of protecting the entire front of the library so hopefully we will be able to replace it yet this summer.